Haunted Tombstone Ghost Tours & Stories - Give You Thrills & Chills! Haunted Tombstone - Does it Scare you? Haunted Tombstone brings chills up your spine - does it not? We've taken some of the local ghost tours here in Tombstone AZ. We've also heard about, and actually experienced, some hauntingly chilling things around town! Are you skeptical - or a believer? We'll tell you all about it - so you can revel in it, or judge for yourself the value of these stories! Tombstone Ghost Tours Vary - Click Here to Share Your Own Ghost Story! Tombstone has a lot of history that lends itself to haunted types of experiences. This has prompted entrepreneurs to begin different types of Ghost Tour experiences. If you're a believer - they may be interesting or even scary. If you're not a believer, they could just be interesting. OR you might feel you'd like to hear the information just to logically want to disprove it! There are 2 types of ghost tours, both only suitable for those 12 and older - too intense for young children. They take you through this historic building which has been featured on Ghost Adventures, Ghost Lab, and TAPS Ghost Hunters. We've taken the Adult Tour. Some strange things happened! Maybe reflective of a haunted Tombstone experience - I'm still a little skeptical. There were a few mysterious light flashes, and some hauntingly scary knocks. Technical meters are used to sense ghosts. One lit up a little! A woman became so scared she and her husband had to leave! Since it's a guided tour, you go through areas of the building that aren't available to regular daytime museum-goers. One part of the experience is to specifically try to attract the ghosts that have been seen or felt there - for instance - by employees. During this event, lights are turned out and you are in total darkness. A requirement is No Alcohol Imbibement prior to the tour! Dare You Enter the Tunnel to a Morgue! Now It's A Shooting Gallery! We haven't yet tried their Ghost Tour. But they've had great feedback for their authentic haunted Tombstone Ghost Tour. After all, it's held next door - in the Watt & Tarbell building - the old city morgue! Can you get much more authentically ghostly than that?? I'd suspect that would be a really haunted Tombstone environment. We plan to get to it for sure! Their location is at 521 East Allen Street - right next to Big Iron Shooting Gallery. Which is inside the old Watt & Tarbell Undertaker's morgue! Get to them on the South side of Allen, between 5th & 6th Streets. The stairway down to The Shaft - It's rumored the Swamper "ghost" still appears! We took this tour years ago. It was okay - but the narrator was a different person. It was the only haunted Tombstone ghost tour available that we could find at that time. It was good enough then. We've overheard the current Narrator, and now see there are a lot more areas included - it seems to be better now than when we took it. It begins each evening just before sundown, gathering in front of Big Nose Kate's Saloon, on Allen Street, between 4th & 5th Streets. We're Karen & Bill - currently we live here in Tombstone. We haven't always lived here. Before, we used to be regular visitors. We moved here after we retired from our jobs. It was something we always wanted to do - because we love the town & its history. When we visited we stayed in Tombstone Motels and Bed & Breakfasts. We learned that one B & B in particular had a haunted Tombstone history to it after we arrived. The Welcome Book in our room described its ghosts! It was the Tombstone Bordello B & B. Originally located in the Red-light district, it was on Allen Street between 6th & 7th Streets. As Tombstone was modernized, the area was razed in 1923 and a school built in that area. As an 1881 home, it was moved to the location at 107 W. Allen St. A judge owned it, and along with his wife updated it with modern utilities. Finally it became a B & B and still is. The spirit visitors seem to be associated with it being a brothel. Bill senses the spirit world more easily than I do. But on occasion I do see glimpses of it. I did so there. I remember seeing a fleeting glimpse of a man in a long dark coat - like a Duster. Bill also saw a woman in a flowing gown. He almost continually had this uneasy sense of a presence there. Out in Front of Our House - We Heard Voices Overnight, but nobody was there! When we retired we found the house we wanted to purchase in Tombstone. We knew we wanted to be in walking distance to town - yet not right in the middle of all the action. We knew the basic type of house we liked. One day on a trip to Tombstone, we just happened upon The One! Called the realtor - and before we even thought it would happen - it was ours! It was a fixer-upper, and we started working on it. The original part of the house was built in 1946. There were 2 or 3 additions added on. It needed quite a bit of work - but we could make it ours, and preserve some original features that made it a Tombstone original! After we completed much of the work, one night we were asleep in our master bedroom. About 5 in the morning I woke up and went into the master bathroom, which is ensuite. When I returned to the bedroom I saw a red flashing light outside the window, which looks out onto the street out front. I also heard voices out there - like a number of people talking. I thought maybe there was an ambulance or police car out front. That there was something happening outside, a neighbor had called the cops or EMT. I walked into the Dining Room to look out the window where I could see better. And there was absolutely nothing going on! I was surprised, but I just went back to sleep. In the morning, Bill said he had awakened early in the morning & heard voices outside - but just went back to sleep. I told him my experience. We both knew that it had to be spirits of the past! Then we thought about the date. It was actually late October - not the anniversary of the Gunfight at the OK Corral. It was actually about 3 days before that. We found out that our home is the site of the California Mine. Every area in the town of Tombstone, plus the hills of Tombstone - was a mine site. We don't know, of course, what residual spirits triggered that weird event. But we're curious to see if it happens again. Regularly area Local Folk go into the Crystal Palace for a few drinks and some conversation. 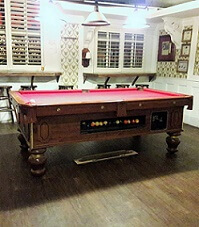 A friend of ours told us about a day he and some others we know were sitting in their usual spot near the pool table. No one was at the table at the moment, playing pool. The Crystal wasn't that crowded. A number of visitors were eating an afternoon meal at the tables. A few others were at the bar. The pool ball set-up had been left on the table. There's a glow on the left, smearing the light & back wall! Is that the ghostly spirit that plays pool? All of a sudden, our friend Bob, along with a few others saw the cue ball zoom down and hit the other balls! They were amazed! They'd never seen anything like that happen before in there. I know there are stories, though, of other haunted Tombstone occurrences in many areas of town. Such as within the walls of the Crystal Palace! Within the walls of what now is Big Nose Kates! Within some of the motels in town, such as the Budget motel which has a historic Old Adobe section. And the infamous Brunckow Cabin and mine! We'd love to hear about your own haunted Tombstone experiences! Did you get a spooky photo? Would you share it with us? Or can you tell us about the eerie happening while staying at a local spot? Do you have a great picture you've taken at a local ghost town - and will share it? And go there to see the haunted experiences of others!